The Amish live in homes without electricity or telephones, ride in buggies and other horse drawn vehicles, and wear very plain, home-made clothing. That’s why they have been called the "plain people". They have chosen to live this way because of not wanting to conform to the rest of the world. The Amish came to the United States in search of religious freedom, as did many people. In Europe, in the 16th century, there was an Anabaptist movement. They were called Anabaptists because they did not baptize infants as the Catholics did. They were seen as the radicals of the Swiss Protestant Reformation. "Anabaptist" means to re-baptize. The first adult baptism recorded was in 1525. A Catholic priest by the name of Menno Simons left the priesthood during this period and his followers became known as the Mennonites. In 1693, Jacob Amman had a conflict with the Swiss Anabaptists because of what he saw as a lack of discipline in the church. His followers eventually became known as the "Amish". In the 1700s, between 50 and 100 Amish families arrived in America, settling mostly in Pennsylvania. Many others followed in the 19th century. Over the years, various orders of Amish spread into Ohio. 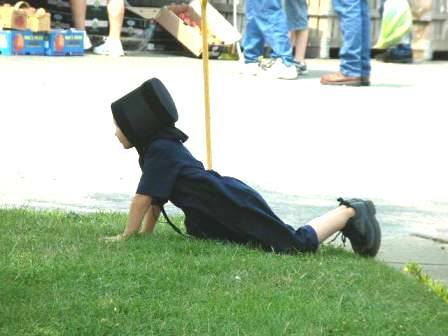 There are several orders of the Amish faith found in Ohio. They are the Old Order, New Order, Swartzentruber, Beachy, Andy Weaver, and the conservative Mennonites and the Amish Mennonites. Most of the orders hold church services in their homes. The Mennonites usually have services in church buildings. The Amish live side by side with the English, but maintain the lifestyle of their 16th century European ancestors. Although most still live on the farm, it is getting more and more difficult to earn a living from farming, so there are many who have other occupations, such as woodworking, cabinetry and carpentry, while others are blacksmiths, buggy and carriage makers, and own repair shops. Others run different types of businesses that appeal to the many tourists, such as quilt shops, hand made baskets, etc. To find out more details about the Amish and the Mennonite, I highly recommend going to "Behalt", the Mennonite Information Center. It is located at 5798 County Road 77. Just go east of Berlin a couple miles on State Rt. 39, then north on County Rd. 77. It is just a little ways up on the right. If you are north of Berlin, heading south on State Rt. 62, it intersects with CR 77 at the village of Bunker Hill. You would then go south on CR 77 from there. "Behalt" is open Monday through Saturday from 9 a.m. to 5 p.m.
From June through October, they are open till 8 p.m. on Fridays and Saturdays. Like most of the Amish or Mennonite owned businesses in the area, they are CLOSED ON SUNDAYS. Just Who Are the Amish Anyway? 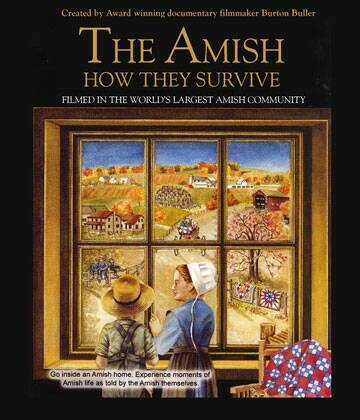 Around the first part of December, 2005, my husband and I attended to the premiere showing of "The Amish: How They Survive", a 49 minute film made entirely in the Holmes County area of Ohio. We both thought it was excellent and decided right then and there that it should be offered here on this website. Over the last 10-20 years I have seen many changes in the Amish. It used to be that about 90% of them lived off the land entirely. Today, however, that has changed with only about 5-10% doing so. In this film you can learn how the Amish have adapted to the changes in agriculture and the economy, how technology threatens their community, and what they are doing to survive. "The Amish: How They Survive" was produced by Burton Buller, whose programs have appeared on PBS, Discovery Channel, Hallmark Channel, and others. It took him nearly 4 years to do it, and I think he did a very good job. It is available here for $19.95 in either Video or DVD, plus shipping. Ohio residents have to keep the state happy by paying sales tax, too. Click on thumbnail picture to enlarge it. Hit "Continue Shopping" to return to this page. I received the DVD yesterday and sat down and watched it. I would like to tell you how much I enjoyed it. It certainly did bring back a lot of happy memories of Holmes County. I would definitely recommend buying it. Note: You may continue shopping on other pages on this website, for books, cookbooks,potholders, baskets, using the same shopping cart.